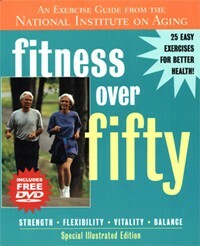 Fitness Over Fifty is an exercise guide for seniors. It was previously released under the title Exercise: A Guide from the National Institute on Aging. It also comes with a free DVD. Recommended for: Older consumers, although anyone who is a beginning exerciser or out of shape would find this book useful. Chapter 2: Is It Safe for Me to Exercise? Chapter 6: What Should I Eat? First, it contains at least 70 black and white photos of older subjects demonstrating specific exercises and stretches. It is appropriate that the authors selected older models for these images. I think many out-of-shape people are sometimes turned off by images of muscled-up body-builders or twenty-somethings with no body fat. Also, the font size for the text is large enough to be read by older readers who have difficulty reading fine print. Chapter 3 provides a nice summary of how to identify a qualified fitness professional. • What Could Be Better: Although the photos are good, there are quite a few that are positioned so that the spine of the book cuts down through the image. Generally, this isn't a problem, but I find this annoying. I've never seen page layout done like this. It makes me wonder if they needed a better copy editor. Instead of "shoulder flexion," just call it "front arm raise"
Instead of "hip extension," a better term is "backward straight leg lift"
Instead of "hip flexion," substitute the term "front knee lift"
The same problem occurs in the section on stretching. What percent of the public actually knows where the "quadriceps" muscle is located? In the photos illustrating each stretch, there should be some visual indicator of the area being targeted. The chapter on "Target Heart Rate" is good, but it could be better. The table of target heart rates is based on the common formula [220 - age]. Since this formula is so widely recognized, and is easy to remember, it's acceptable. However, researchers at U. Colorado came up with a formula that they believe is better (see my review: "Exercise and Heart Rate"). Unfortunately, this chapter doesn't say enough about "resting HR" and "recovery HR", which are really the indicators of how "fit" your cardiovascular system is. Hopefully, future editions of this book will cover these concepts. Chapter 6 "What Should I Eat?" should be deleted. It's inconsistent with the title of the book. Pages 118-119 attempt to provide the reader with a perspective on supplements. But, this topic is much too complicated to address in a page and a half. Finally, the end of the book has a nice listing of resources. However, the authors limited the list to only professional and not-for-profit organizations, thus leaving out many good ones. Generally, Fitness Over Fifty gets high marks. It covers a lot of useful material in a short, easy-to-use book. I can recommend it, though the elimination of medical jargon would make it better.